I don’t think I have to say it- but there are very few destination restaurants for lunch in Midtown. You know what I’m talking about… the place you can recommend wholeheartedly, without any concern for how far the person will have to travel to eat the meal your endorsing. The truth is, I write about places to eat lunch in Midtown every week, and some I even talk about like they’re the greatest ever. But you know, and I know- they’re not REALLY the GREATEST ever. They’re just good for Midtown. That’s why almost every one of my postings is qualified with “This is not the best ___________ you’ll ever have, but it’s good enough for lunch in Midtown”. 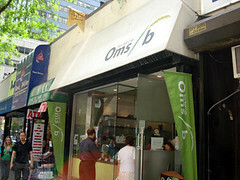 Well- finally I can say I found a “This IS the best ____________ you’ll ever have”, IT’S IN MIDTOWN- and it’s called Oms/b. Very exciting indeed. Now that I’ve totally overhyped this place- check out the pics, the menu and of course, the +/-, all after the jump…. Oms/b is short for Omusubi, or to put it into English, a Japanese rice ball. 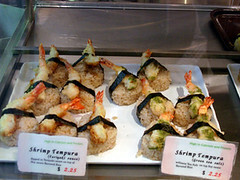 They come in many shapes and sizes, and can be stuffed or topped with things like spicy tuna, salmon, shrimp tempura, eel, seaweed, edamame, etc. Some are triangle shaped, and wrapped in seaweed, others are round balls of rice, topped with something delicious. Initially you may think it is like sushi, but there are some major differences. First, there is no raw fish in any of the Omusubi I’ve seen here (I’m not sure if traditionally it can have raw fish- but here in New York, I’ve only seen it with cooked things, or vegetables). 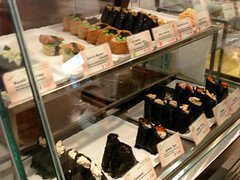 Second, unlike Sushi, Omusubi is meant to be entirely portable, and can be eaten for breakfast, lunch or a snack. Alright… you get the picture- now onto the helpful information: What and how to order? Here’s the thing, Oms/b is pretty intimidating. There are a lot of options, and it’s tough to order on your first trip. Not to mention, it’s a pretty small place, so if you go after 12:45pm, there tends to be a line; and that line of people is not interested in waiting while you decide. So with that in mind, I suggest doing as much research as you can before getting there, so you’re prepared. The most popular option is SET A (from the set menu). It includes any 3 rice balls you want plus soup for $7.50. Initially, this seems like a great idea, because you get to choose whatever you want- but this option is only good if you are going to get what I refer to as the “big money rice balls”. These are the ones stuffed with eel or shrimp or meat of some kind. These are over $2.00 ala carte, and make the SET A worth it. If you are interested in the vegetarian choices, it might be cheaper to order ala carte. Look at the prices of the rice balls you are interested in before making your choice. SET B is the vegetarian option, and the cheapest set menu. 3 vegetarian rice balls, an appetizer (which is pickled vegetables of some kind) and soup. The set is pre-made, so you don’t get to choose- but if you are thinking of going all vegetarian, this might be the easiest and cheapest way to do it. The Special Set is 3 rice balls, and appetizer (the same seaweed salad), and soup for $6.50. Once again you don’t get to choose which rice balls you want, but it’s $1 cheaper then set A, and you also get the pickled vegetables. In the end, as appealing as the Sets are, if you don’t care about the soup, but you really want to choose your own rice balls, it might be better to order ala carte. But if you are looking for a deal, and don’t care so much about choosing, Set B & the Special Set are the way to go… and if there is a rice ball that looks particularly good- get it in addition to the set. Your meal will still be under $10. ONE IMPORTANT NOTE: If you are used to stuffing your face (like I am), 3 rice balls and soup is probably not going to fill you up. For this I have a few suggestions: #1. Get the Deluxe Set… or as I like to think of it- the “fat guy” Set. 4 rice balls, 4 kind of appetizers, and pickles, for $9.99. If that seems like overkill, or too expensive, just add a few more things to your 3 rice ball SET. An extra rice ball, or one of the appetizers. 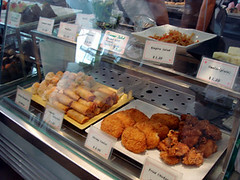 They have all sorts of delicious things, like fried chicken, dumplings, tofu nuggets and croquettes. Both ideas will still mean a lunch that is around $10. Not the cheapest ever, but still in the reasonable range. Not a good value. It’s mostly rice, and there’s not a ton of filling in each ball. I’d rather eat sushi. There’s no raw fish. Not a lot of food. After three rice balls, and some soup, I’m still pretty hungry. The restaurant is really small and cramped. There are very few tables to sit at, and they are not the most comfortable, so either get there early, or expect to take your food to go. Posted by Zach at 6:00 am, August 31st, 2006 under 45th btw. 3+Lex, Japanese, Oms/b. Love the ikura, eel and shrimp tempura! So yummy! 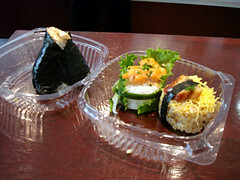 omusubi is also known as onigiri. 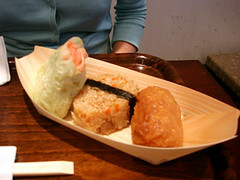 people have said onigiris originated with the samurais. they needed a quick and easy-to-carry meal when they traveled or were at war. as for present day japan, you can purchase an onigiri at convenience stores and vending machines. you know, for our commute and our war with those delinquent copiers. I wish they had a place like this near my office in Los Angeles! the popcorn shrimp onigiri is fantastic. I’m probably in the minority here but I don’t think the place is as good today as when it opened up. For example, in the spicy tuna the actual tuna part seems to be a good deal less these days than I remember, especially compared to other onigiri I’ve had. It also appears to be mostly spicey mayo and very little tuna even. I still go but I’ve had much better, unfortunately when i live in LA. When it comes to Onigiri I have to vote Zaiya. I’m a fan of the seaweed wrapper being crispy, and Zaiya wraps their rice balls in that nifty plastic wrapper that keeps rice from seaweed until you are ready to eat it. I’ve also had Onigiri in Japan at various convienence stores ( 7-11 for example) and they use the same wrappers… I’m not sure thats actually a convicing testimonial though…..
this place is better than zaiya, though it’s a little more expensive. seems fresher and tastier. really like that popcorn shrimp. I used to enjoy this hole-in-the-wall but the servers are rude and surly. The food is good for a light snack or picking something up for the train. It’s refreshing compared to other greasy options, but don’t go there for any type of “experience”. Rice balls are gaining popularity all over the place. I used to get them as a kid in Japan and now they are also hugely popular in Korea. I usually love Oms/b but the last time I went it was awful, everything just tasted off. Oh and another difference between rice balls and sushi: no vinegar in rice balls. This place is a total revelation for me. Have been in such a bland midtown rut! Had the spicy tuna and the pop corn shrimp. They were delicious and the woman who helped me was really nice. Inspiration to check out your other recommendations! I finally tried oms/B today. I totally do not get what all the hoo-ha is about. A little fleck of salmon or eel on a giant ball of rice. Bland, dry, expensive food, really uncomfortable tables — the only positive thing I can think of to say is that the staff is very nice, unlike what one commenter said. When OmsB was under construction, I’d walk by every day, saying, “ooh, I can’t wait until this place opens!” When they opened shop, I was NOT disappointed. I’ve been going to OmsB ever since the first day they opened and the quality of their food has always been top notch. I usually stop by in the morning for the “morning set”: 2 onigiri, a small miso soup and some tsukemono (pickled daikon). If they’re not too busy, don’t feel guilty about asking them to make your onigiri fresh. It’s worth the wait, the rice is warm, delicious and aromatic (yes, contrary to popular American opinion, well-cooked, quality rice has a lot of flavor). 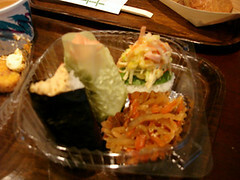 My personal favorites are: Mentaiko (spicy cod roe) unlike some other places- they put a decent amount of roe in the onigiri and it doesn’t ever have that nasty hard, outer “shell” that is commonly found in mentaiko riceballs, Ikura (salmon roe) I have yet to figure out how they manage to press the riceballs without crushing all those precious little salmon eggs, Wasabi Shrimp (great “shrimpy” flavor with a super wasabi kick to it), Sake & Ikura (cooked, salted salmon mixed with rice, filled with salmon roe and wrapped in a yellow soy wrapper) and the Yukari Ume (the rice is mixed with prepared beefsteak leaf, filled with a preserved plum and the entire thing is wrapped in a pretty, pink soy wrapper). If you go there during an off-peak hour (mid-morning or mid-afternoon), definitely ask for your riceball to be made fresh– otherwise you risk the chance of getting onigiri that’s been sitting in the case a little too long. You won’t get sick, it’s just a drag to eat a cold, slightly dry riceball with soggy nori. As for the service, all the girls that work there are perfectly polite, sweet and KAWAII!!! I LOVE Oms/b. This place is definately my Favorite!! I went to their Tasting & Cooking Class the other day, and found out their ingredients are fresh and well selected. The way they cook rice is different from others ( they put bamboo charcoals), using natural sea salt, their seaweed is expensive one as well. Of course it’s much better than other japanese places. I am seeking a place to buy onigiri or as I have heard them called, Kimbobs. Onigiri is great and I got it at Sunrise Mart but the nori was too mushy and I am seeking the ones in a tight celephane and crunchy/dry nori – please help! Finally trekked over to the east side today to check this place out. It is a cute little shop, great looking food, and we found the staff to be friendly and quick. My coworker and I got spicy tuna, hajiki, california roll, chicken, shrimp popcorn and chili shrimp. It was all “ok” – we weren’t blown away by the flavors and thought they could have used some seasoning. The chili shrimp had the most flavor. I was surprised that the spicy tuna wasn’t spicier – tasted like regular tuna salad to me (I like Zaiya’s version better). My coworker did like the miso soup (scallions instead of seaweed) and I liked the seaweed salad. I did like the rice, white and brown – it was really, really good. All the ingredients did taste fresh. We decided we liked it, but not enough to make the walk over there again. I may go back if I happen to be in the neighborhood. I asked one of the workers there, ” what do you recommend?” being that there was such a grand selection. She recommended that I try the spicy tuna rice ball. It was the first time I had tried it. I really enjoyed it. I usually eat the salmon rice ball but now I have come to enjoy something different for a change. 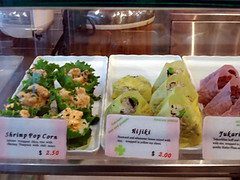 The way they dress up the rice balls makes it more enticing to want to try the others, very colorful and of course healthy and hardy. Prices are very reasonable and I would highly reccommend eating there every chance you get if you are into rice balls…David Coqueran. The price of the 3 ball set is up to $8.50. The flavors are subtle and well executed. I had the eel, ume and salmon roe and each was a simple presentation of the main ingredient, with balance from the rice treatment in each ball. The eel was nicely sweet and the ume seemed to have tiny bits of roasted tea leaves. Maybe not a great place if you are in the mood for huge flavors, but the variety of tastes in this group was very nice. No line today at 1. I agree that the spicy tuna lacks bite but, nonetheless, I fully intend to try each different item over the course of the next few weeks. You really cant beat the price or awesome selection here. Omusubi!!! I’ve been looing for these. I had them in Japan ~~ they sell them at convienent store for 1$$ excellant so happy! !